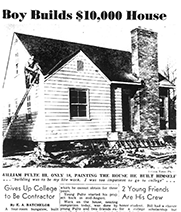 A true American success story, PulteGroup got its start in 1950 when 18-year-old William “Bill” Pulte, with help from his high-school buddies, built a five-room bungalow near the city of Detroit, MI. In constructing his first home, Bill set the corner stone on what would grow into one of the largest and most successful homebuilding companies in this country’s history. In a world where less than one-third of new businesses ever get to celebrate their 10-year anniversary, PulteGroup’s long history of success is a testament to Bill’s vision and the passionate people who have worked to fulfill it over the years.